In Part 1 (Rent Vs. Buy: A Guide for Brides), we helped you decide whether renting or buying a wedding gown is the right choice for you. Today in Part 2, we get into the fun stuff with tips, trends, and info on how to set up an appointment. Let’s start off with some entertainment to help you relax. After all, we know what it’s like – we see dozens of brides each month. That’s television for you. At ORA, it’s not quite the same. Our brides are never that demanding, and we have the best time with them. Of course, we may not have as big of a selection, but Daisy handpicks all the dresses in store, and we have regular shipments every few months. Now, to get into the gowns themselves. Remember the wedding gown your mom wore? It was probably lacey, had sleeves, and a Victorian neck. If not, count yourself lucky. These days, any style goes, depending on your personal style and body type. On that note, here are some of the most sought after styles and details this year. The relaxed mermaid. We’ve seen it enough to know that the mermaid style can be hard for people to wear, particularly petite brides. However, this year, a popular trend is the slightly more relaxed mermaid style, which is less tight and creates a generally softer line. Lace. This isn’t your grandma’s lace – it is delicate, pretty and romantic. What makes it modern is the styling of the gown itself. Try it on the hem or just on the bodice, this is a detail that adds such dimension and romanticism to a gown. The simple ballgown. The ballgown is always a popular style because not only does it make the bride feel like a princess, it is also super flattering. This year, we are seeing a simpler variation. The shape is the same, but designers have cut back on the details to really focus on the bride. This style looks best when accompanied by a sweetheart neckline. The corset back. Even though we are going simpler, it doesn’t mean that we are getting any less dramatic. The corset back adds drama to any wedding gown, and the bonus is that the fit will be impeccable. We always get brides worrying that it’ll take too long to do up, but when they see themselves in it, the results are so worth it. Interesting detailing. This year, we are really starting to see designers take risks when it comes to the details, while leaving silhouette simple. Keep the shape flattering, then find that one detail that makes your dress unique, whether it is a bow, a chiffon ruffle, or beautiful embroidery. White or ivory? Ivory has become increasingly popular as choice wedding gown colour because it is softer on the skintone. White tends to be more stark, and is considered the traditional wedding gown colour (reason why many grooms actually say they prefer white – who knew?). But in photography, no one really notices the colour of the gown. So, it depends on two things. #1 Style of the dress and #2 Your own skintone. Most brides notice immediately once they try on both what colour looks best on them. Consider your body type and height. It’s true – some shapes and styles look better on some girls than others. But that’s no reason to fret. There’s a perfect style for every bride. So while it may seem that you may not get to wear the mermaid style after all, the A-line may suit you to a tee. Don’t wear a dress too similar to the one your best friend got married in. Enough said. Follow your instincts. If you love it, you love it. Simple as that. Accessorize accordingly. Accessories really have the power to complete a look – settle on your dress first, then personalize it with the right veil, necklace, etc. If you’re a tiara girl, go for it; it not, there’s headpieces too. If you feel that the dress is a little on the simple side, go for something a little more glam and dramatic. Give yourself time. An average appointment lasts about 1.5-2 hours. Make sure you’re not stressed the day of – the worst thing is to feel rushed while trying on 5 lb. gowns. Although it gives our consultants a bit of a workout, that’s for sure. Bring just the people closest to you. Very ideally, you’d come to the appointment with 1 other opinion aside from your own. That’s all you need. Remember that everyone has different tastes. It can get confusing when the groom, your sister, your mom, your best friend, your grandma, your dad, your cousin, your roomate, your bridesmaids, etc. are all there, with divided opinions. Really, the only opinion that matters is your very own. Be open-minded. Try on different things, get to know what really looks good on you and what doesn’t. Though we all have ideas of what we think looks best on us, we’ve seen enough times where a bride ends up choosing a dress that is completely different from she would’ve imagined for herself. Let the consultant know what you are thinking. We’re here to help you. And last but not least, please book an appointment! Though we do accept walk-ins, there is no guarantee that our fitting room will be open. We prefer to give our full attention to brides, so it is always best to check beforehand and make sure we can accomodate you. Last time, Daisy let us in on her tips for achieving the natural look. This time, she provides tips and secrets for both brides and makeup artists to achieve the most beautiful you. Get a facial a week before your wedding day. A professional facial will do wonders for the tone, clarity, and smoothness of your skin. But make sure you don’t wait until the day before, because the skin can be extra sensitive after a facial. If you’re not experienced in doing it yourself, please go to a professional – it makes a big difference! Moisturize, moisturize, moisturize! Dry skin is a killer for a good clean makeup application. Always make sure your skin is well moisturized. Remember, it is always easier to take down extra shine than it is to apply product on dry skin. Use the right products. Don’t try anything new without testing it out beforehand. If something has worked for you before, don’t be afraid to just go with it. Your wedding day is not the day to be experimenting. That’s what the makeup trial is for (highly recommended just in case you get an allergic reaction, which can happen). But if you’re doing anything yourself, tried and true works best. The right primer and concealer will do wonders. 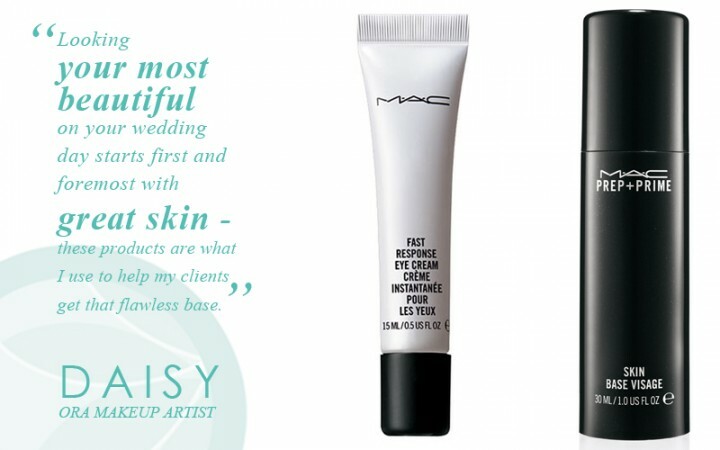 Daisy uses the following products below for a clean finish that lasts the full day, very important for the wedding day. Make sure your makeup artist has hygiene practices. This cannot be taken for granted or underestimated. Dirty and unwashed brushes can spread bacteria and cause you to break out. Blending is key, and the right tools are necessary. Different areas of your face require different brushes and application methods – your skin is the biggest organ on your body, and even on your face, has different sized pores. All brushes are not made equal, but the right tools and techniques, as any professional makeup artist knows, is just as important, if not moreso, than the products used. And last but not least, eat healthy and get your sleep! Makeup application actually starts from the inside out. We know that sometimes it can be hard to maintain healthy habits before your wedding day, but try your best. Good sleep = good skin. Eat a well-balanced diet, with lots of nutrition. And don’t forget to get your exercise. Exercise promotes healthy blood flow, which actually does wonders for your skin. You’ll get that natural glow you’ve always wanted, and that is always a great start for any makeup application. So there you have it, Daisy’s tips and secrets for excellent makeup application. If you ever have any questions, she will be more than happy to answer any inquiries to make sure that you will look your best on your wedding day. And if you’re a 2011 bride, remember to book Daisy early – she’s going to have a busy wedding season, as always. It’s already March – can you believe it? That means that the 2011 wedding season is right around the corner. And if you haven’t already found your dream dress, it’s about time you get started! Aside from taking wedding and pre-wedding photos, Ora also sells and rents wedding gowns, as well as a small selection of evening gowns and traditional dresses. Some brides come in knowing that they want to rent, while others are on the fence – still, others are adamant that they want to keep their wedding gowns for sentimental reasons. Here are some tips we have to share with any brides as to what to expect, and how to decide whether or not you want to rent or buy your wedding gown. It’s cost effective. You aren’t just saving on the cost of the dress – don’t forget about alterations and dry-cleaning, which can add up to $500 extra to the cost of purchasing a gown. For most companies (including ORA) that rent out gowns, those costs are included. Weddings are expensive affairs and costs can quickly add up – know upfront what you need to pay, it’s as easy as that. What are you going to do with your wedding gown anyway? Sure, it’s a romantic notion to want to keep the dress to pass it down to your daughter. But think of it this way: if your mom didn’t pass on her dress to you, chances are, no matter how beautiful you think your gown is, you will do the same. It’s good for the environment. Renting a dress is not only good for your budget and your closet space, it’s also good for the environment. For a dress you’ll only wear once, it does take a lot of resources to produce. So you should either keep it or throw it away – what a waste! We’ll help you accessorize. When you rent from us, you have the option of renting our bridal accessories as well – we have a wide selection of veils, tiaras, necklaces and headpieces. More styles to choose from. We update our stock quite frequently many times throughout the year for both rentals and saleable gowns – however, we do have limited space and will not always have the particular style you love. If there’s a dress you love from a certain designer that we carry and you know that it’s your dress, we can get it in for you, if you purchase it. These days, a wedding gown doesn’t have to remain a wedding gown after your wedding day. If you’re practical but still want to keep your wedding gown as a little reminder of your big day, there are ways to work with that. We’ve heard of people cutting and dyeing their gowns to turn them into cocktail dresses. It should be the dress you’ll remember for the rest of your life – for such an important occasion, there’s no reason you should have to give that up for your budget or practical reasons. This is your dress, and you’ll be the only one wearing it. Sure feels good, doesn’t it? Sell it. Plenty of brides decide to go this route, whether or not they knew for sure before purchasing their gown. Buying it leaves the option open to keep it, alter it, or to sell it afterwards. There’s no right or wrong answer – it all depends on you. Having said that, if you’re planning on purchasing your wedding gown, then you probably already know that there is usually a 6 month lead time, so its most likely too late to go that route if you’re getting married this summer, but if you know you are going to be renting, then you’re right on time. Pending upon availability, you can rent a wedding gown and have it altered by us within a week if you needed to (true story – it’s actually happened to us!). We are getting the newest 2011 styles (wedding gowns and evening dresses) at the end of March/early April. 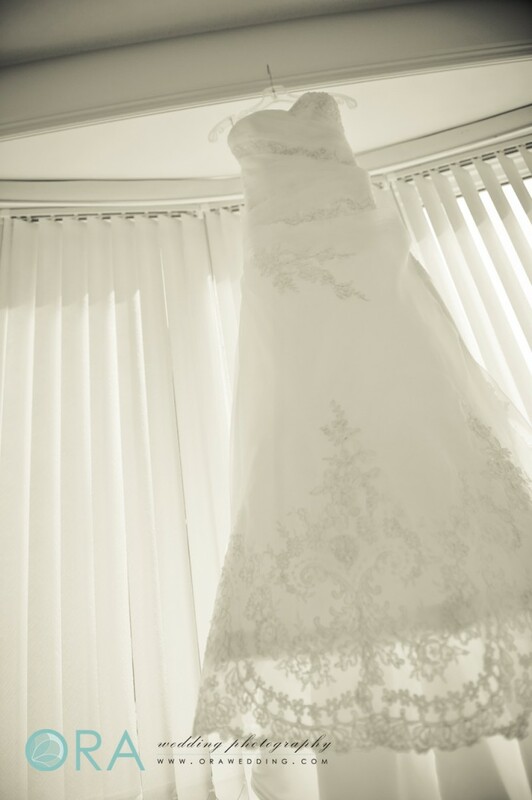 If you are one of our brides, make sure to book an appointment with us then to make sure you get your first choice. And if you’re interested in viewing our selection of gowns, make sure to let us know and we will set up a date and time for you. If you’re still on the fence between renting and buying, but don’t worry, we can help you with that too. Watch out for Part 2 of this post, where we let you in on some tips for choosing the perfect wedding gown, including 2011 trends, tips for dressing your body type, and the answer to the eternal question: White or ivory?